Much of what makes Yorkshire a great conference and event destination also makes it a superb place to spend leisure time. Yorkshire offers a fantastic array of places to visit, as well as historical, cultural and sporting sites to be enjoyed through partner programmes and for attendees who want to extend their stay. Here are a few suggestions for itineraries for partner programmes and event attendees staying on in Yorkshire after conferences and events. Start the day in York with a visit to York Minster. Explore the history beneath your feet in the Undercroft with a highly acclaimed audio tour. Go on to discover the legends of the railway and the story of steam at the National Railway Museum, York. Enjoy lunch at Hotel Du Vin at York where the Bistro offers classic European cooking with a contemporary edge. 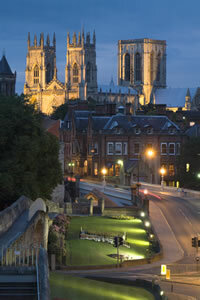 To finish the day, take an evening stroll and join a Ghost Walk and discover why York is one of Europe’s most haunted cities. On day two, start your day in Haworth and discover the home life of the famous Bronte sisters with a visit to the village and the Bronte Parsonage Museum. In the afternoon, enjoy a road trip to either of Yorkshire’s two Unesco World Heritage Sites; Fountains Abbey, near Ripon or Sir Titus Salt’s model mill workers’ village at Saltaire, near Bradford. Round off the day with afternoon tea at Betty’s in Harrogate. Harrogate borders the Yorkshire Dales National Park which boasts some of the country’s finest countryside, superb for walking and outdoor pursuits. From wild expansive moors and high rugged cliffs to picturesque rolling hills and a stunningly beautiful coastline, Yorkshire’s great outdoors is not to be missed. The Yorkshire countryside is the perfect place to enjoy a wide range of outdoor activities. Dalby Forest in the North York Moors is a real haven for mountain biking. Routes are graded, like ski piste, from gentle forest trails to rather testing, black-graded, technical single-track. Dalby isn’t just about cycling though, the high wire forest adventure course, at Go Ape, offers a thrilling perspective on the forest. The coast also offers its fair share of fun. Surfers will know that Scarborough has a fine reputation for the quality of its waves. Yorkshire’s five cities are great shopping destinations. Leeds is dubbed the ‘Knightsbridge of the north’ for good reason; it boasts exquisite designer and boutique shops, not least in the glorious Victoria Quarter. A trip to Bradford will reward you with Britain’s biggest Asian department store, Bombay Stores. 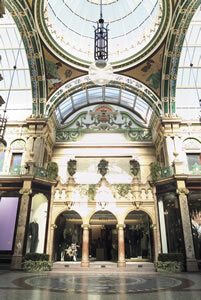 Sheffield has everything from malls to markets. Hop on the supertram to Meadowhall and you’ll find one of Europe’s largest shopping centres, housing more than 270 shops! Alternatively head for Hull where you’ll discover designer boutiques in Savile and George Street and high street stores in Princes Quay and the Prospect Centre. For something different try the cobbled streets of the Old town where the indoor market offers a diverse array of goods with everything from fruit and flowers to handbags and handmade cards.